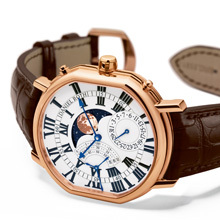 What’s the point of admiring the moon on your watch if the mechanism designed to reproduce its cycles is not accurate? After two years of development, the master-watchmakers at Daniel Roth are responding to this question with a new timepiece that is enriching the Athys line and will require no adjustment for the next 125 years: hence its name, Athys Moon 2134. One could hardly have hoped for a finer or more symbolic feat to mark the International Year of Astronomy. 2009, a special year for Daniel Roth. This year marks both the brand’s 20th birthday and the 400th anniversary of Galileo’s invention of the world’s first telescope. In May 1609, the Italian physicist and astronomer devised an optical system that would enable him, after several months and countless trials, to view the Moon with all its mountains and craters, as well as the sky and its many planets. To celebrate the event that dramatically changed the history of humankind and its knowledge of the universe, the United Nations Organisation has declared 2009 the International Year of Astronomy, appointed UNESCO as the lead agency and the International Astronomical Union as the implementing body. 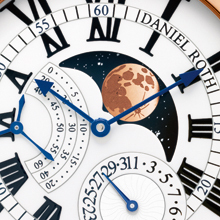 The Daniel Roth master-watchmakers wished to improve the often inaccurate existing moon-phase displays. In standard mechanisms, the disc showing two moons comprises 59 teeth. Driven by a one-notch rotation every 24 hours, it performs a half-turn in 28 days and 12 hours. Compared with the real lunar cycle (29 days, 12 hours, 44  minutes and 2.8 seconds), the display thus accumulates a discrepancy of +44 minutes per lunar cycle, meaning +8.81 hours per year. The far more complex and accurate astronomical moon-phase mechanism of the Athys Moon 2134 comprises three wheel-and-pinion sets. The first performs a full rotation in 24 hours, driving the second in 7 days, which in turn drives the 135-tooth moon disc. The latter completes a half-turn in 29 days, 12 hours and 45 minutes, which means the relative error amounts to just -0.02 hours or 12 minutes per year. This greatly improved accuracy means adjustment is required just once every 125 years! Representing a first for Daniel Roth, the Athys Moon 2134 houses an extremely beautiful mechanical hand-wound calibre (DR2300) developed on a Frédéric Piguet 151 base movement. Crafted in harmony with the noblest watchmaking traditions including exquisite Haute Horlogerie finishing and originally designed for pocket-watches, this modified 16-lignes Lépine type movement powers the brand’s iconic three-arm seconds hand, aligned with the crown and constituting an integral part of the main gear train. Larger than the movements generally made by the Manufacture, it called for the creation of a case suited to its generous stature. The understated and timelessly elegant Athys Moon 2134 finds its natural place within the classic line of which it reflects the main signature characteristics: large Roman numerals, blued steel hands, a “railtrack” minute circle with Arabic numerals and a three-arm seconds hand at 9 o’clock. These distinctive features are complemented by a date display at 4 o’clock, a raised depiction of the moon between 12 and 4 o’clock in the same colour as the case. The correctors on this model are pushpieces designed to facilitate adjustment operations and avoid any risk of scratching. The Athys Moon 2134 in a nutshell. This exclusive new Daniel Roth timepiece is equipped with a Lépine type mechanical hand-wound DR Calibre 2300 (16 lignes and small seconds lined up with the crown). Launched on the occasion of the International Year of Astronomy (2009), it features an extremely accurate large moon-phase display requiring manual correction only once very 125 years – hence its name evoking the next scheduled adjustment: Athys Moon 2134. The white-lacquered dial carries hour and minute hands, the brand’s characteristic three-arm seconds hand, a date display and a raised large moon display appearing through a window. A spectacularly complex feat and an invitation to a form of contemplation that inevitably fires the imagination. 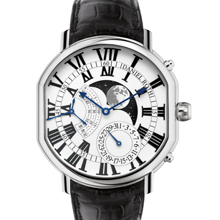 The Athys Moon 2134 is destined to delight fine watchmaking enthusiasts as well as appealing to amateur astronomers.